SAVED by the Bell Promotion main man Elmer Anuran said he’ll make a formal appeal to the Games and Amusements Board to review the result of the pulsating fight between Jun ‘‘Hercules’’ Doliguez and Dennis ‘‘Scorpion’’ Tubieron which had a bloody yet controversial ending last Friday at the overflowing Mandaluyong Gym. ‘‘There were lapses in the judges scoring. It could have been a draw, that’s why I’m asking for a rematch,’’ said Anuran, who promoted the boxing extravaganza in cooperation with Solar Sports and the Mandaluyong City government headed by Mayor Benhur Abalos. Anuran pointed that the bout was tied at the end of the fourth before the stoppage. ‘‘The result could go either way or it could be a technical draw,’’ said Anuran, who was puzzled that a judge scored it 10-10 in one round. The fight was stopped in the fifth round by referee Sammy Bernabe Sr. following the advice of ring physician Rolly Rivera as Doliguez suffered a deep and long cut in the forehead following an accidental clash of heads. Tubieron went on to win by technical majority decision, winning on the scorecards of two judges (Warren Jaro, 47-46; Jerrold Tomeldan, 47-46) while SP Lopez saw it tied (47-47). As promised, both world-class fighters exchanged heavy blows to the delight of the screaming crowd but an accidental clash of heads in the 5th round ended what could have been a thriller of a fight between two featherweight world title prospects. ‘‘The cut was six inches and very deep,’’ noted Rivera. 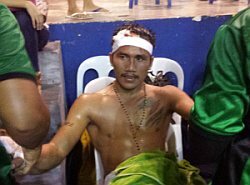 Before the fateful round, Doliguez also suffered cuts near his nose and forehead due to headbutts in the earlier rounds. Tubieron boxed very well in the first round as he even floored Doliguez. But Doliguez gamely finished the round and became the aggressor in the succeeding rounds. Basketball crowd-drawer Arwind Santos, two-time world champion Jerry Penalosa, former Comelec chairman Ben Abalos, Solar Sports Chief Executive Officer Peter Chanliong were among the bigwigs present in the event. Jethro Pabustan and Angelito Merin battled to a technical draw, while Roberto Gonzales knocked out Mark Sales in the third round. Other winners in the much-applaused SBB undertaking were; Jerome Clavete, Bernie Baron, Fernando Venus, Rowel Rosia, Jestoni Autida, Edwin Mondala and Ernesto Saulong.